Having already posted one awesome Mercedes-Benz Zetros expedition truck earlier in the year we didn’t expect to find another. But like feet, Noah’s animals, and your Mom’s chin, Zetroses it seems, come in twos. 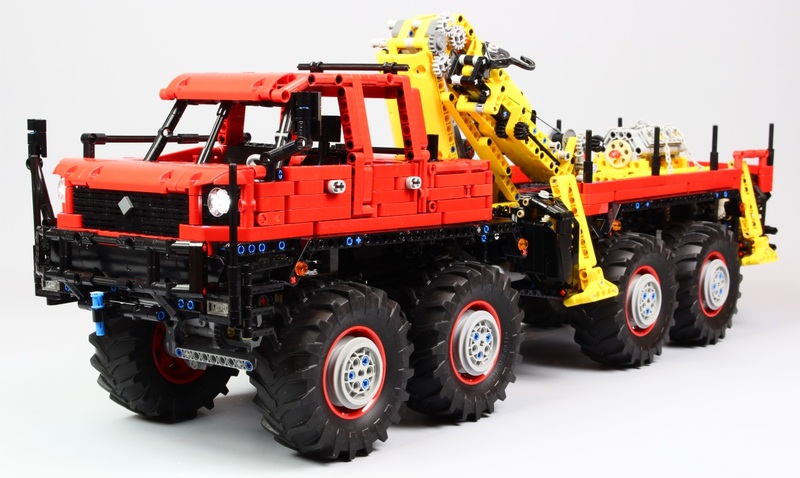 This spectacularly well-engineered Zetros expedition truck comes from previous bloggee jrx and it’s packed with brilliant Technic functionally, with seven Power Functions motors fitted inside, controlled via two SBricks and a LEGO IR Receiver. Each wheel is driven by an XL motor, a Servo controls the steering, and two further Medium motors power the winch and a retractable awning. Fourteen sets of LEDs give jrx’s Zetros working head and tail lights, flashing turn signals, roof-mounted floodlights, and even interior lighting. The model also includes functioning suspension on all four wheels, a fully fitted interior, and an ATV stored on-board. 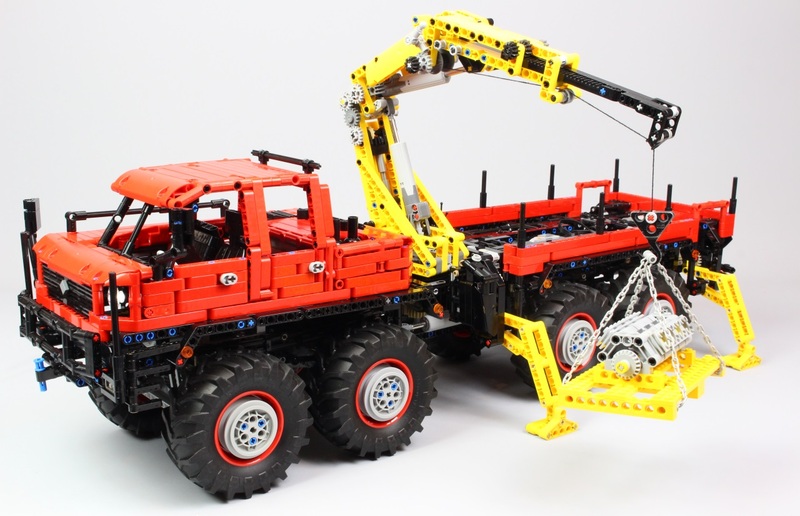 There’s much more to see of jrx’s excellent expedition Zetros at both Flickr and the Eurobricks forum – click on the links to join the journey, and you can watch the truck in action via the video below. Here at The Lego Car Blog we receive all sorts of requests for endorsements. Frankly this is as surprising to us as it probably is to you, because we’re idiots, but nevertheless somehow we’ve found ourselves in a position of power. POWER!! We may have got a little over-excited at this realisation but don’t worry, we were brought back down to earth when we asked our intern to pose for the picture above, with the result being a new entry into the Mis-Conduct Box and a picture of a mini-figure instead. Back to the task in hand, and it’s probably time to assemble some of our recommendations into one handy guide. So here they are, TLCB Recommends…. We’ve tested two third-party LEGO-compatible bluetooth products here at The Lego Car Blog, and we’re pleased to say that both earn a recommendation. Reviewed here earlier in the year the SBrick controller provides Lego models with bluetooth capability, allowing control via a mobile phone, gamepad, or other device. This has clear advantages over LEGO’s own IR control, being unaffected by bright sunlight, and allowing the receiver to be completely hidden inside a model. Where the SBrick really scores though is the superb programmable app, allowing the bespoke set-up of a model that surpasses even LEGO’s own Mindstorms robotics sets. 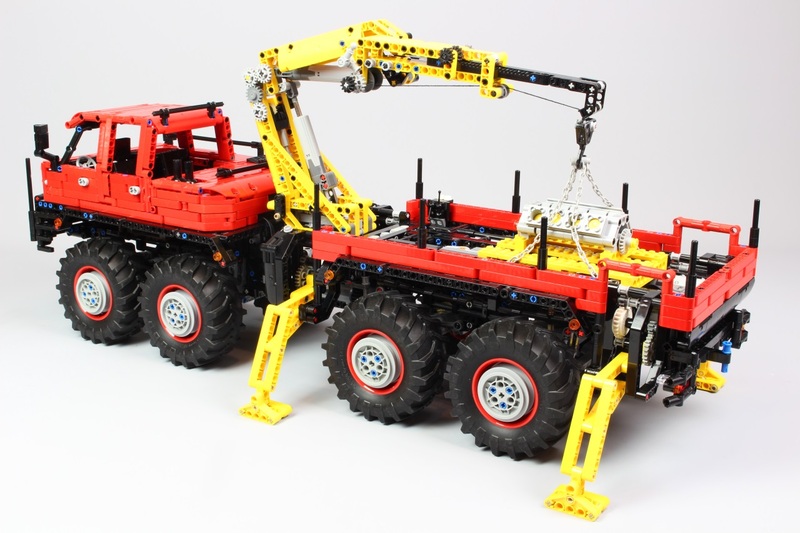 We tried the SBrick with the LEGO Technic 42030 Volvo L350F set and were amazed by how easy it was to set up, and how beautifully controllable the Volvo became. It’s a new dimension in Lego robotics. Like the SBrick above, the BuWizz offers all the benefits of bluetooth control, but with the added bonus of a built in battery that can provide up to eight times the power of LEGO’s Power Functions system. The BuWizz brick can be programmed too, although we found this far more limited than the SBrick’s abilities, but really this product is all about power. The BuWizz bluetooth battery genuinely transforms what Lego models can be capable of, and whilst we suspect far more axles, gears and pins will break a result, their owners will be having riotously good fun in the process! Read our review of the BuWizz brick by clicking here and see how fast your model can go. We’ve reviewed loads of Lego-themed books over the years and most are really very good. Our favourite publishers are the guys at No Starch Press who have brought several top-quality building books to print, including some authored by builders who have featured on these very pages. You can find all of the books we’ve reviewed via the Review Library, and you can check out NSP’s current range via the link above. Our ever-expanding Set Review Library has become (and this is a rare thing at TLCB) something that we’re quite proud of. With one hundred sets, third-party products and books reviewed to date, a few of which were written by you – our readers – it’s as good a place as any to find out whether that eBay seller really can charge that much. However our reviews are only written by us lot here at TLCB Towers (plus a few from you) and, as mentioned previously, we are idiots. Better then to trust an amalgamation of many reviews before you make a purchase decision, and the brilliant Brick Insights does just that. Pulling review information from multiple sources (of which we’re one) you can quickly see all the reviews for a particular set, the average, highest and lowest scores and much more. You can read our overview of Brick Insights by clicking here and you can check out the site itself via the link above. Don’t buy another set without it. Yup, because we’ve been interviewing the very best Lego vehicle builders on the ‘net in our ‘Master MOCers‘ and ‘Become a Professional‘ interview series. If you’d like to know how some of the greatest Lego model-makers create their masterpieces, and very probably learn some useless facts about them too, then head over to the Interviews pages via the links above. We’ll be adding more builders to this Hall of Fame very soon too! We’ve a whole heap of references worth your clicks to be found in the Directory, including the sources our Elves use to find creations, rival blogs, games, Lego User Groups and Friends of TLCB. Take a look via the link above, and remember that your clicks and page visits here at The Lego Car Blog directly contribute to worthy causes around the world, as our limited advertising revenue is dispersed to those who need it more than we do, and that’s entirely thanks to you. Renault may be better known for things like this and this, but it’s a little-known fact that they’re also the inventors of the modern tank. The tank was first used by the British Army in the First World War, but it was horrendously slow, unreliable and a magnet for unwanted attention. Renault took the idea and simplified it, creating a vehicle that was much lighter, more reliable, and featured a fully-armoured 360-degree rotating turret. The Renault FT-17 could also be operated by a few of just two, and it thus became a phenomenally successful design. Around 3,000 units were produced in France (mostly in 1918), whilst another 950 were built under license in the United States. Twenty-seven countries/revolutionary armies used the FT-17 over the next thirty years and the design fought in almost a dozen separate wars, which probably says as much about mankind’s propensity for war as it does the brilliance of the FT-17. This beautiful Lego replica of the Renault FT-17 has been built by TLCB regular Sariel, who has recreated the world’s first light tank in glorious detail. Inside the stunningly accurate shell are three Power Functions motors, a Micro Motor, and a third-party SBrick programmable bluetooth control brick. Each track is suspended via oscillating bogies and powered by an individual Medium Motor, a third Medium Motor rotates the gun turret, whilst the Micro Motor powers the gun barrel elevation. It all works perfectly, as demonstrated in the excellent video below, and you can see all the photos and read more about the build at the Eurobricks discussion forum and via Sariel’s Renault FT-17 Flickr album by clicking here. Sold by Ford during their purge in 2010 to stave off bankruptcy, Volvo are now under the ownership of Geely, and – much like Jaguar and Land Rover sold to the Indians by Ford two years previously – the Chinese have done a far better job of managing Volvo than Ford ever did. By providing cash and economies of scale, but by letting Volvo be Volvo, the cars coming out of Gothenburg are a world apart from the dull badge-engineered knock-offs built under Ford’s stewardship. The latest XC90 encapsulates this mantra; with superbly Swedish design, engines no larger than 2 litres, using turbocharging, supercharging, and hybrid electric to boost performance, and self-driving technology, Volvo’s flagship SUV is very probably the flagship SUV. Not bad for a company best known for estate cars. This beautiful recreation of the latest XC90 ‘Excellence’ edition comes from previous bloggee dgustafsson1317, and he’s built the big Volvo brilliantly. A superbly detailed exterior (including bespoke 3D-printed wheels to replicate those on the real car) continues inside with a stunningly accurate interior, made all the more impressive by the need to squeeze in a raft of Power Functions electronic wizardry. Five motors power the all-wheel-drive system, steering, and the electrically opening tailgate, all of which are operable remotely via a Bluetooth device thanks to a third-party SBrick. The build also features all-wheel suspension, neat brick-built windows, and some excellent custom badges too. There’s much more of the model to see at dgustafsson’s enormous Volvo XC90 Excellence album on Flickr – click the link above for over fifty stunning images.